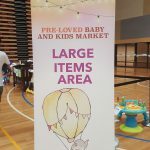 The Large Items Area is designed for you to sell your bigger items such as cots, prams, rockers, bikes, outdoor toys, safety gates, change tables, bassinets and more. It makes it easier for the shoppers when looking for a particular item as they will find everything in one place and it gives you more space at your stall for your clothing and smaller items. Below are the instructions on how the large items area works and how to prepare your large items at home. Each item must have its own Large Item Label. On the morning of the event you will find two large item labels on your stall table. You have to fill these out and add to your large items (if you have any to sell). A maximum of 2 items per stallholder applies. 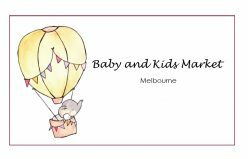 Should you require assistance when completing the labels, Baby and Kids Market Melbourne staff will be there to assist you on the day. The Large Items area will open as soon as the stallholder access commences at 8am. When bringing items to the Large Items Area all goods must be carried where possible to avoid scratching the floor. Please ensure items with plastic wheels such as highchairs and change tables have the brakes turned off so the wheels can turn freely. Please bring the whole label (label and receipt) to the Large Items area along with your item. There is no need to cut the label; the market staff will do this during the check in process. They will then attach the top label to your item and give the receipt back to you. The check in area will close at 8.45am and no further items will be accepted after this time. This will allow the market staff to display the items accordingly and to carry out the final quality checks before the market opens at 9am. To avoid loose pieces and smaller objects such as cot screws and pram covers being lost or stolen we encourage stallholders to securely attach these to the items where possible or hold them at your stall and give to the buyer once the item has been sold. As the shoppers enter the market they will go to the Large Items Area to view the items for sale. Should they wish to purchase an item they will come to your stall. The market staff will assist the shoppers with finding the stalls by providing them with a small map of the stall layout. Once you and the shopper have agreed on a price they then pay you for the item, you give them the receipt. Please ask the buyer to bring the receipt to the Large Items Area to advise the staff that the item has been sold. This will stop other shoppers coming to your stall to buy an item that you have already sold and allow us to remove the item from display for security purposes. It is also a good idea to advise the market staff once you have sold an item as buyers can forget to do this. Please be assured we will not release the item unless we are given the original receipt with your matching name on it. If you find that you are not getting any enquiries about your item, you may want to review the price. We encourage you to consider dropping the price as early in the day as possible as you want to sell the item and not take it home! You can change the price on your large item at any time by going to the Large Items Area and changing the price on the label. You do not need to gain permission from the market staff to change a price. Unsold large items must be collected at the conclusion of the market. When collecting your item/s please bring along your receipt that was issued to you that morning so that we know the item is yours. The market staff will remain in this area to assist with the check out process till 1pm after this time the area will be unsupervised and all items will be left unattended. When collecting items from the Large Items Area all goods must be carried where possible to avoid scratching the floor. Please ensure items with plastic wheels such as highchairs and change tables have the brakes turned off so the wheels can turn freely. Please see the Market Staff if you have any questions on the day – we are always happy to help!